You know what they say – practice makes perfect. I suppose that can be applied to the world of golf, as you want to make sure your muscle memory is perfected so that regardless of the conditions and pressure out there on the green, you will be able to deliver and land that putt with confidence. Sure, you could always go out and look for a coach to help you get that swing and putt right, but in these economically challenging times, perhaps there must be another far more affordable method? The $239.99 Golf Putting Aid might be an answer to your prayers then. With the Golf Putting Aid, you will be able to improve your putting accuracy and distance control using this rechargeable device. It is a highly portable digital trainer that sports a trio of putting modes in addition to a quartet of training games so that you can build your confidence and have more fun on the course, instead of spending time swearing and getting all flustered because of all those near misses. 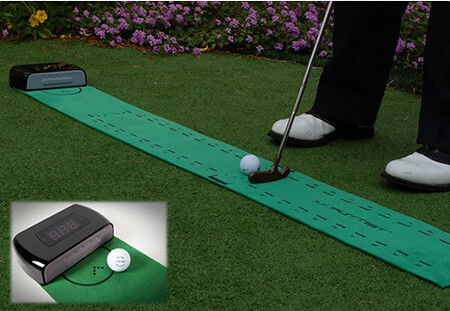 You can opt to use the Golf Putting Aid anywhere thanks to the included 5′ putting green, allowing you to make more putts from 6 to 20 feet, in addition to getting closer to the hole on putts of 20 to 45 feet.